Rachel Von | The Journal Gazette The TinCaps' MacKenzie Gore pitches the ball during the third inning against the Whitecaps at Parkview Field on Monday. It's MacKenzie Gore Day at Parkview Field again. The 2017 No. 3 overall pick will make his fifth start of the season tonight and will be pitching on normal rest for just the second time this season. The left-hander's last start left plenty of reason for optimism, though it was an abbreviated outing. Gore pitched two scoreless, hitless innings Sunday against the Lansing Lugnuts in his first start since May 14 and struck out three. He commanded his fastball on both sides of the plate and threw 24 of his 36 pitches for strikes. His fastball command has been his calling card since he was in high school and it was encouraging to see him really overpower hitters for the first time this season. It will likely be another short start for Gore tonight, but he should be able to at least pitch into the third inning this time. It will be considered a successful appearance if he begins working in his offspeed pitches with more frequency and commanding them when he's behind in the count. For a second straight outing, left-hander Aaron Leasher will "piggyback" with Gore, coming in first out of the bullpen and treating the game like a start. 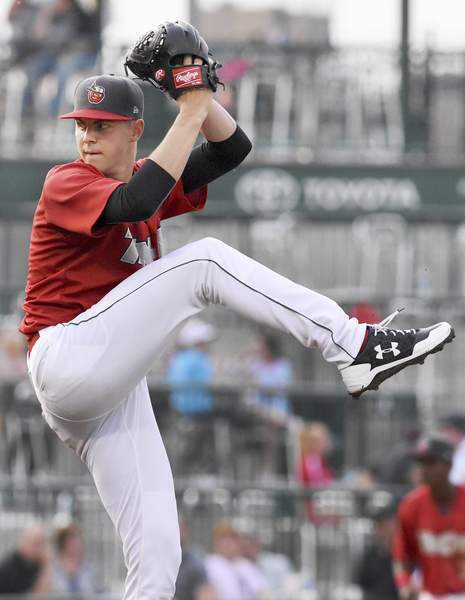 Leasher, one of the TinCaps' four All-Stars, pitched six shutout innings in relief of Gore last Sunday and has not given up a run in 13 innings out of the bullpen this season. Gore will get most of the publicity as usual, but the outcome of this game is more likely to hinge on how well Leasher pitches in relief. The two starters will have to contend with a Great Lakes lineup that had plenty of chances to score on Friday, but could only push across two runs. The Loons went 1 for 14 with runners in scoring position in the first game of this series and were unable to score despite putting two runners on in the sixth, seventh and eighth. That pattern likely won't continue for a second straight game, so don't expect the TinCaps to continue wriggling out of trouble if the Loons keep putting runners on base. Great Lakes will counter the pair of TinCaps left-handers with fellow lefty Victor Gonzalez, who will be making just his second start of the season. He also missed all of 2017 after undergoing Tommy John surgery. This is his third season in the Midwest League and he posted a 3.61 ERA in 94 1/3 innings in the league in 2016. Before his surgery, he sat 89-92 with his fastball, with decent control and an average curveball and changeup. It remains to be seen whether he can return to the form that once made him one of the better pitching prospects in the Dodgers' farm system. He'll take on a TinCaps lineup that includes Robbie Podorsky, who went 5 for 5 with two RBI and three runs scored last night. Podorsky will hit second tonight, with Jeisson Rosario back in the leadoff spot. Tirso Ornelas, who carries a 19-game on-base streak into tonight's matchup, will hit third, giving the TinCaps a fearsome top of the order. They'll try to take an early lead and have Leasher and the rest of the bullpen hold it late.